Most runners permanently, and prominently, display their race medals. And who can blame them? No matter what your distance, it takes a lot of effort to run a race, still more to train for one. So displaying medals or race bibs is a great way to remind yourself, and others, of a truly remarkable accomplishment. But aside from my Boilermaker glasses and one race picture, my walls are free of race memorabilia. I guess I am just a little different. In each of the previous four years of marathon running, it has been my custom to keep my medals and bibs on top of a bookshelf in my apartment during the running season. Then, each Christmas, after all the races are run and I am cleaning to make room for my decorations, I put my race bling carefully in a box and put the box in a closet. That way, when January comes around, I don’t dwell on past successes or agonize over failures. I just begin again with a clean slate. It’s my philosophy for running and for life itself. Miles behind me have already been run and are of no use to me anymore. Miles ahead of me are too unpredictable to contemplate. The only mile I can comprehend, the only mile I can do anything about, is the one I am running right now. So as I write this, the bookshelf is bare, and the process of training for my next marathon and proving myself has begun again. Except that this year, so far, it feels like I’m reinventing the wheel. It’s my own fault. It’s partly due to the fact that I … ahem … put on a “little” weight over the holidays. I paid for it all through the month of January. But it wasn’t just that I was running like a hippo and working far too hard for those easy nine-minute miles. I’ve been there before, and can usually power through January and shed the extra pounds with a little bit of effort. You better believe I paid attention to that voice and finished the route. Two days later, I ran it again, only this time I was two minutes faster. So it hasn’t been all doom and gloom. I have had other breakthrough runs in training, including a gorgeous eleven-mile run around Canastota on an unseasonably warm February day. Without even trying, I ran at an 8:40 pace–not too shabby this early in the program. Figuring that variety might help me get out of this funk, I decided to change things up a bit for this program and cross train on the stationary bikes at the gym rather than do my gentle runs on the treadmill or outside. The choice has made things a little more interesting; it’s also resulted in my legs feeling rested and strong when I take on long runs. I also decided to get back to doing weights to strengthen my core and legs. I did it last year and really felt a difference– I am sure it is why I was able to shave six minutes off my PR at Burlington. But last year, I broke off the routine and was very inconsistent about my trips to Planet Fitness the last two months before the race. So this year, even if there’s precious little mojo to be found in a gym (especially under the watchful gaze of Bill O’Reilly on the monitor screens), I will do what I can to reap the benefits. Last week, I ran a pitiful twenty-nine miles–twelve miles under program mileage (because life). This week looks like it could be another low mileage week as well. Admittedly, the weather has been lousy and far too frigid to run outdoors. But there’s no denying the mojo is definitely missing. So I have to keep reminding myself: Week seven has just begun. Progress may be slow and sometimes nonlinear, and the bookshelf may be gathering dust, but there is mojo out there to be found if I just keep running the mile I am running right now. 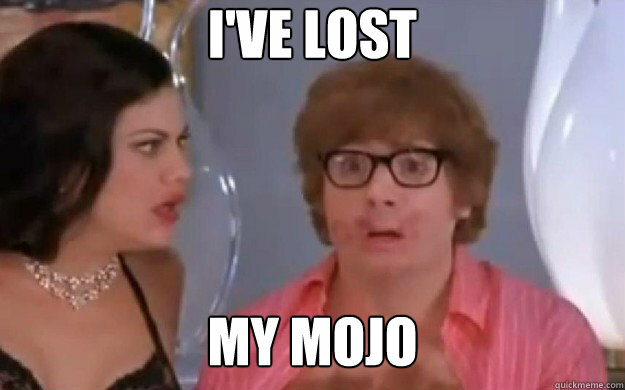 What do you do when you lose your mojo? Send me your tips/tricks/thoughts/suggestions and I’ll feature them in an upcoming blog. This entry was posted in The Flat-Footed Fox and tagged Kiwanis Kingston Classic Marathon, long-distance running, marathon training, Planet Fitness, Syracuse 1/2 marathon, Syracuse Mountain Goat, training, Vermont City Marathon (Burlington). Bookmark the permalink.